Using the basic palette of Indonesian ikat-creamy white, deep brownish red, and indigo blue-the woman who tied and dyed the yarns for this textile created an atmospheric scene of ships with tall masts on a dark, mysterious sea. Notice that the yarns for the fringe were carefully bound in order to preserve their original color. 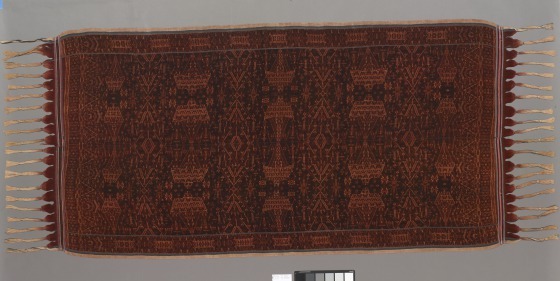 By the end of the 20th century, fi gurative motifs were rare in the ikat-patterned textiles of Flores. This example suggests that more varied designs existed in the past. The ship is a symbolic image throughout Indonesia, signifying safe passage for the human spirit during times of transition and crisis. This type of shoulder cloth is a man's garment, associated with elders and prestige.